Inspiration in the kitchen often comes from discovering new vegetables. Let me introduce you to the celery root—also called celeriac, turnip root celery, and knob celery. It is also called sedano rapa in Italy, eppich in Germany, ache-douce in France, and gen qin cai in China. I guarantee that the celery root will inspire your cooking in many ways. Not to mention, there is definitely a lot of nutrition contained within this knobby root vegetable. For starters, the high vitamin K content makes celery root essential for brain function and bone strength. Other nutrients within celeriac also make it great for digestion, fighting cancer, and reducing the risk of heart disease. Let’s take a deeper look at celery root and why you should be using it. Celeriac is a very interesting root vegetable with a deep history. Celery root belongs to the carrot or Apiaceae family, and its plant name is Apium graveolens var. rapaceum. This biennial vegetable will grow one-meter high and 0.5 meters wide, and grows best in rich and moist soil with full sunlight. The plant is cultivated throughout the world, including northern and Mediterranean Europe, Siberia, North Africa, Southwest Asia, and North America. There are also many types of celeriac available, including prinz, alabaster, monarch, bergers, and snow white among others. The celeriac has a similar growth habit and appearance to the leaf celery; however, it is grown as a root for its large and bulbous midsection rather than its leaves and stem. The roots are big, swollen, and knotted, with an odd rounded shape. It also has brown and rough skin that covers its delicious white and creamy flesh. It features a sweet, earthy, nutty, and subtle celery flavor that tastes a little like parsley or the upper part of the celery stem, and it is slight bland and bitter. The celeriac skin is a shade of white, and the inner flesh is white like a potato. Old texts show that celery root was of medicinal and religious importance in ancient times of Greece, Italy, and Egypt. For instance, the ancient Greeks were first thought to use celery root in 800 B.C. Traces of celery root were also found at the tomb of Pharaoh Tutankhamun, who died in 1323 B.C. Celeriac found made its way to modern kitchens in the early 1600s after French botanists gave their praise about the root vegetable. Homer also mentioned celeriac in the epic, Odyssey. Today, California produces the most celery root on the market. 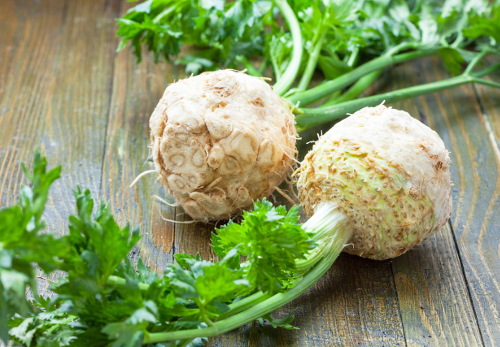 What is important about celery root nutrition facts? A cup of cooked celery root contains 9.1 grams of carbohydrates, 1.8 grams of fiber, and 1.5 grams of protein, along with some fat. For a micronutrient perspective, celery root is loaded with vitamin K that amounts for 34% of the recommended daily amount required. Celery root is also a good source of vitamin C, vitamin B6, phosphorus, manganese, iron, and copper. It contains amounts of vitamin E, vitamin B1, vitamin B2, vitamin B3, vitamin B5, folate, zinc, magnesium, and calcium. The following is a comprehensive celeriac nutrition chart with information for one cup of cooked pieces of celery root, or 155 grams of this root vegetable. There are many celeriac health benefits that make this root vegetable worthwhile to use. These health benefits of celery root are due to its anti-inflammatory, antioxidant, antibacterial, and anticancer properties. Celery root has long been used in traditional Chinese medicine to lower high blood pressure. In fact, scientific studies have suggested that certain phytochemicals in celeriac called phthalides are responsible for these blood pressure-lowering effects. Celeriac contains potassium, which may help lower the risk of hypertension by reducing the harmful effects of sodium. The vitamin K may also improve brain function in Alzheimer’s disease patients. Celeriac has also found to minimize neuronal damage in patients with Alzheimer’s disease. The powerful anti-inflammatory nutrients in celery root like vitamin C and vitamin K have been found to reduce a major inflammation marker called interleukin-6. Celeriac may also improve skin health, prevent Parkinson’s disease, boost the immune system, treat arthritis, protect against anemia, activate metabolism, and help cleanse the kidneys. The following are five more celery root benefits you should keep in mind. The high antioxidant content in celeriac may help fight cancer and prevent cell oxidation. Vitamin C, in particular, may help destroy free radicals that can transform healthy cells into cancerous ones. Also, biologically active compounds in celeriac called polyacetylenes have exhibited potent anticancer potential against acute lymphoblastic leukemia. The polyacetylenes within celery root with cytotoxic and anti-prolierative activity include methyl-falcarindiol, panaxydiol, falcarindiol, and falcarinol. The high fiber in celeriac is needed for proper digestion and metabolism. The fiber will bind to water, fats, and digested food to form a bowel movement. This results in regular bowel movements and relief from constipation. The vitamin K in celery root acts as a modifier of bone matrix proteins, and this improves calcium absorption, and may also prevent osteoporosis and bone fractures. The fiber in celery root will bind to ingested fat, which indirectly reduces blood lipid levels and the amount of fat absorbed from the intestines. The potassium in celery root can also help relax the blood vessels, which will lower your blood pressure and possibly prevent hypertension. The carbohydrates in celery root provide an instant energy boost. Also, the vitamin B6, vitamin B5, and other B vitamins in celeriac play a major role in macronutrient synthesis that is necessary for energy production. Throughout the year, celeriac can be found at grocery stores, health food stores, and local farmers markets. However, peak season for celeriac is from November until April. The healthiest way to eat celery root is raw, but it may lack some flavor. People often describe celeriac having a much stronger flavor than celery. As a result, many consume celery root with other strong ingredients to neutralize the flavor. It is a popular root vegetable to use during the winter season for stews and soups, or as a mashed dish. It can also be roasted, blanched, and used in salads or curries. You can even prepare baked celery root chips. You can also eat it fried, or grate it raw over dishes as a garnish. Celeriac is also sometimes used as a substitute for potatoes in various dishes. Let’s take a look at a couple of celery root recipes to get you started with this vegetable. Peel and chop the celery root into small pieces. In a large skillet, brown the celery root over medium-high heat in some coconut oil, and gently season with sage and salt. Once the celery root has browned, add water and garlic, and let the root steam on medium-low heat for 15 to 20 minutes. Check to make sure the celery root is not too dry, and add more liquid if necessary. Add the coconut cream, and mash the celery root to achieve your desired consistency. You can also add additional spices for enhanced flavor. This recipe will serve about four people. Heat the coconut oil in a large pot, and sauté the garlic and onions until they are tender. Add four cups of water or vegetable stock. Add the chopped pear and celery root, and bring it to a boil. Let it simmer on low for 15 to 20 minutes until the pear and celery root is tender. Using an immersion blender, blend the ingredients until you’ve reached your desired texture. Add more spices, and season to your desired taste. The recipe will serve four people. Although there are many health benefits of celery root, there are a couple things to keep in mind before using the root vegetable. For example, there are some people who are allergic to celery that should avoid celery root. Celeriac contains furano-coumarin compounds that may be harmful to sensitive skin, including xanthotoxin, bergapten, psoralen, and isopimpinellin. People taking diuretic or coagulant medications should also avoid celeriac. Avoid medicinal celeriac supplements during pregnancy because they may cause sensitivity reactions. “Celeriac, cooked, boiled, drained, without salt Nutrition Facts & Calories,” SELFNutritionData; http://nutritiondata.self.com/facts/vegetables-and-vegetable-products/2395/2, last accessed Feb. 28, 2017. McCoy, W., “nutrition Facts for Celery Root,” LIVESTRONG; http://www.livestrong.com/article/534223-nutrition-facts-for-celery-roots/, last updated Oct. 26, 2015. “Celeriac – Apium graveolens var. rapaceum,” Health Benefits Times; https://www.healthbenefitstimes.com/celeriac/, last accessed Feb. 28, 2017. Todd, T., “Health Benefits and Uses of Celery Root,” Steady Health; http://www.steadyhealth.com/articles/health-benefits-and-uses-of-celery-root, last accessed Feb. 28, 2017. “Celeriac nutrition facts,” Nutrition-and-You website; http://www.nutrition-and-you.com/celeriac.html, last accessed Feb. 28, 2017. “Health Benefits of Celeriac,” Juicing for Health, April 29, 2015; http://juicing-for-health.com/health-benefits-of-celeriac., last accessed Feb. 28, 2017. “Celeriac,” Only Foods; http://www.onlyfoods.net/celeriac.html, last accessed Feb. 28, 2017. “7 Health Benefits of Celeriac,” DoveMed; http://www.dovemed.com/7-health-benefits-of-celeriac/, last updated June 11, 2016. “Celery Root,” Organic Authority, Dec. 8, 2010; http://www.organicauthority.com/vegetables/celery-root.html., last accessed Fe. 28, 2016. “Properties and Benefits of Celeriac,” Nature Word, Dec. 6, 2015; https://www.natureword.com/properties-and-benefits-of-celeriac/. “What is Celeriac Good For?” Food Facts Mercola; http://foodfacts.mercola.com/celeriac.html, last accessed Feb. 28, 2017. “Celeriac Benefits, Reviews, Side Effects and Dosage,” Vitamin Store, June 14, 2013; http://www.vitaminsestore.com/celeriac-benefits-reviews-side-effects-and-dosage/. “6 Health Benefits of Celeriac,” Give Recipe; https://www.giverecipe.com/6-health-benefits-of-celeriac/, last accessed Feb. 28, 2017. “Celery Root mash,” Stupid Easy Paleo; http://stupideasypaleo.com/2013/04/01/celery-root-mash/, last accessed Feb. 28, 2017. “Celery Root Pear Soup with Super Tasty Croutons,” Joyous Health, Feb. 23, 2017; https://www.joyoushealth.com/27080-blog-celery-root-pear-soup-with-super-tasty-croutons, last accessed Fe. 28, 2017.